Of all the things we find on the label of a bottle of wine, perhaps most important is the appellation. Getting down to the heart of the matter, the appellation is simply the wine’s address. It’s where the grapes were grown. This simple fact of where grapes were grown gives an oenophile a deep understanding of what’s inside the bottle or can. Yes, the bottle or can! A can of wine on the store shelf cannot yet be called ubiquitous, but that day may be coming. More wine is found in cans every day. Barokes Wines of Australia claim to have been the first to can wine, inventing their own process in 1996. The Francis Ford Coppola Winery in California released their Sophia Blanc du Blanc in cans in 2004. Now, brothers Greg and Yannick Wertsch, owners of Ontario’s Between the Lines Winery, along with their partners Philip Chae and Lucian Cao, have just introduced their own wine in cans, the first in the region- Origin sparkling wine. Greg and Yannick were 25 and 22 years old when they started Between the Lines in 2010. They were the youngest wine makers in the area, but between them they had attended wine making school in Germany and Ontario for ten years. They began their winery by renting a building on their parents’ family farm, and finding an investor who paid for tanks, labels, and glassware. The launch was in November 2011. Early on, the brothers made the kinds of wine everyone knows, wines that originated, were developed, and became famous in other parts of the world. They soon felt disappointed with the results of trying to make a wine in Ontario that was better suited to another region. They decided to go change course. “We wanted to create something that would be “Ontario” for a long time,” explained Greg. Between the Lines’ appellation is 100 percent Niagara Peninsula. For centuries, wine makers have recognized the influence of place on wine. Where grapes grow, the particular environment contributes to making those grapes unique to that very location. These conditions are often referred to as terroir, and the region as an appellation. The Vintners Quality Alliance (VAQ) is the authority on appellations in Ontario. The VQA website (vqaontario.ca) discusses the importance of appellation. “The physical features of land and climate – the nuances of soil and sun; the minerality and taste characteristics of diverse landscapes – influence the choice of vine cultivars and viticultural practices across Ontario, and create unique conditions for the production of grapes and wine. As wineries and winemakers cultivate, interpret and elaborate terroir through wine production, they in turn shape our tastes and interaction with the land.” Ontario’s Niagara Peninsula has more acreage devoted to wine than any other viticulture area of Canada. Forty-six varietals are grown on 13,600 acres. The terroir is dominated by fresh water, with the Niagara River to the east, the Welland River to the south, and Lake Ontario to the north. The area’s soil was shaped over 200,000 years by glacial and interglacial events that resulted in thick layers of clay, silt, and sand. The area has a cool climate, with wide shifts of temperature from day to night. Winds extend the growing season into late fall by bathing vineyards in air that has warmed over the summer-heated lake. In the spring, air that has cooled over the winter-chilled water is blown over the vineyards slowing the warming, and delaying budding until after any late frosts. This is the Niagara region where Greg and Yannick grew up on the family farm where their dad grew grapes for other vintners. As boys, both Greg and Yannick planned to leave the farm. Gregg enrolled in a few semesters of microbiology, and Yannick did the same with computer science, but their roots reached too deep into the Ontario soil. Sitting at a desk just didn’t satisfy either of them. They quickly realized that wine was their future. The idea for offering wine in cans was Greg’s. “I studied wine making in Germany. They had sparkling wine in cans. The US has Sophia. There was nothing like it in Ontario.” He didn’t have to convince Yannick. Yannick’s a wine maker. He makes wine. He doesn’t argue about what his wine gets put into. The process of going from “idea” to actually holding a can of Origin wine this past January took four years. It began with the most obvious question, what wine will we can? Vidal is a white hybrid that is tough enough to thrive in the cold weather of Canada. Vidal was developed by Frenchman Jean Louis Vidal for use in the production of cognac. The grape is now at home in Ontario, Quebec, Nova Scotia, and British Columbia, and the northeastern United States. It is a primary choice for ice wine, and is so approved by Canada’s Vintner’s Quality Alliance. As the canning project progressed, it grew. Greg soon found he needed partners. That’s when he called on his partners Lucian and Philip to join him. Lucian and Philip had been students of Greg while he was teaching at Niagara University. They were very enthusiastic about the idea and quickly signed on. The team next considered the can. What about it? 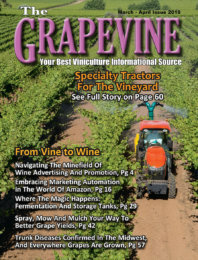 Canning wine is still so uncommon that the issues, though simple, are not widely known. There are three considerations: don’t touch my wine with metal; keep the gas, lose the air; and don’t make vidal bombs. That is, contain the pressure! First, aluminum flavored wine? Aluminum cans are now lined with materials that are the latest innovations in science. These new materials have revolutionized the canned beverage industry. Beer and soda cans are also now lined. Canned beer is quickly being recognized (and tasted) as every bit the equal of bottled. Enough canned wine has already been tasted, that wine lovers can be comfortable that this problem is solved. There’s no aluminum in canned wine. Next, “contains no oxygen”. “We want our sparkling wine drunk as soon as it’s bought,” Greg says. “Origin” is not meant to age in the can. This means that oxygen slowly creeping into the can the way it does through a cork is not a major problem. Still, (no pun intended), sparkling wine is sparkling. You don’t want the sparkle escaping. A sparkling beverage in a leaky container will slowly but steadily become a still beverage. A can of wine is sealed air-tight. Nothing gets in, and nothing gets out. This sealing is accomplished by a remarkable machine system. At Between the Lines they do the canning themselves. The system first cools the wine which then is poured into a can that has no top at all. The can is filled to overflow so that there is no air in it. The lid is put over the can and sealed. Nothing inside but wine. What about the pressure? Relax. The can is fine. Between the Lines orders their cans from the Ball Corp. Ball, located in Broomfield, Colorado makes a lot of cans. Their 2014 sales totaled $8.6 billion US. Between the Lines cans were custom designed and tested by Ball. Although Origin is meant to be drunk within days of purchase, the can is designed to hold its contents for a couple of years. Ball also pointed out a happy bonus of canning. Cans are 100 percent recyclable. Of all the containers used for beverages, the aluminum can is the most recyclable. Arriving at a can that works is just the can’s beginning. Next, there is the very important matter of how it looks. Greg was aware of the “ideas” about canned wine. Many people who love wine are still concerned about the quality of a wine that is distributed the same way soda and cheap beer are. “We needed a can that didn’t look like beer or soda,” Greg remembered. beer or soda. It’s relatively tall and thin, much more graceful and elegant than the typical six pack. The colors are also not the typical bright blue, red, or green. The Origin can is white with gold detail. It’s much more in keeping with the image of the wine which is described on the Between the Lines website (betweenthelineswinery.com) as, “an aromatic sparkling wine crafted with a kiss of Vidal Icewine. Pale gold with aromas of bright stone fruit and citrus, a crisp acidity runs across the palate to give a lingering and refreshing finish. A fine balance of sweetness and perlage, the mouth feel is savoury, soft, and smooth. Tickling the palate with a sweet effervescence of peach, apricot, and honey and a clean citrus finish.” In a can! In matters of wine, as much as anywhere else, talk is cheap. The test is the taste. The only way to know that canning wine is really working is to open a can and taste it. For that, you’ve got to go to Between the Lines in Ontario, or shop on their website, betweenthelineswinery.com.